The thyroid controls all of that stuff, which is exactly why it is so important. Because of that importance, experts have acknowledged that your thyroid gland could be behind just about any imaginable symptom. It is now well-known that many can have problems with their thyroid and have it go unrecognized for quite some time. This is true both for those who have already been diagnosed and put on treatment, as well as those who have not yet been diagnosed with having a thyroid disease. Key Insight: The drawback of the importance of your thyroid is that while many symptoms can point to thyroid disease, many of these same symptoms could be in relation to just about anything else going on in your body. For this reason, it can be tricky to nail down when something is going on based on symptoms alone. What we want to do today is distinguish the “signals” from the “noise,” when they concern your thyroid health. This is important both for those who might think they have something wrong, and for those who know they have something wrong, and want to explore preventative measures. Let’s cut through all of the frustration, and bring you a guide which directly ties particular symptoms with the health of your thyroid. Chances are you might have seen a lengthy list of possible thyroid symptoms at some point in your life. The same chances apply that this list went on for pages and pages and pages. 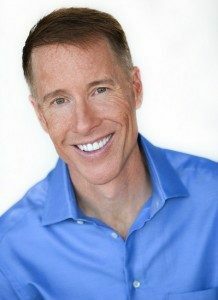 It’s true that your thyroid might be able to cause all of those things, but the drawback is that at any given point in time every single person on planet Earth will have some of those symptoms. This makes it difficult to understand which symptoms are normal, and which might be tied to your thyroid. 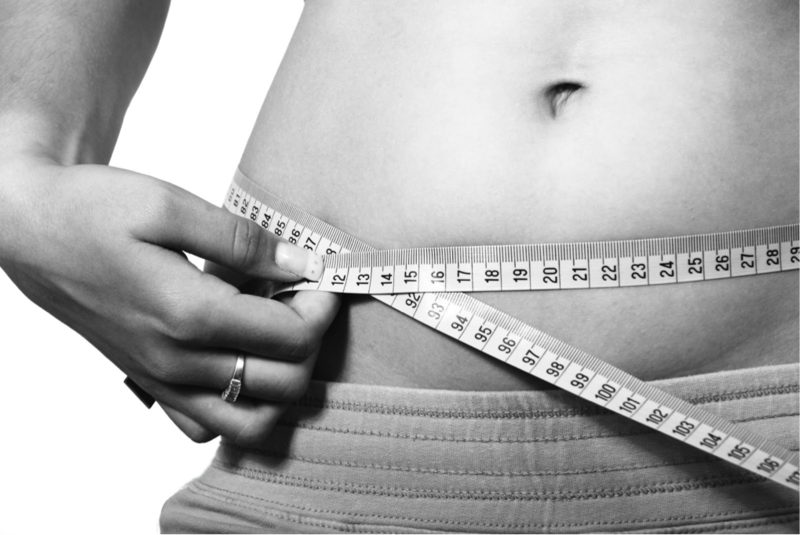 The drawback is that it might leave you feeling like you are not succeeding when it comes to your thyroid treatment and that you are not healing your body. Or, you might find yourself stressing about a problem that does not even exist. 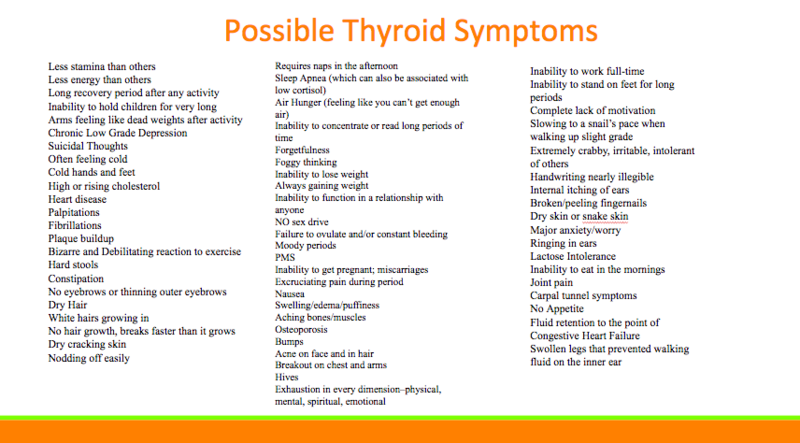 In Conclusion: As you can see, there are so many possible symptoms related to your thyroid. It hurts our ability to know if we are doing the right thing for our thyroid, and what is actually even going on. Let’s find the clarity that we need today! This is something great that I recently came across. This was a study (1) performed in 1995, which looked at roughly 24,000 people. They gave these people surveys of symptoms and screened them for symptoms and thyroid levels. They only checked TSH and T4 levels and they only considered people to be hypothyroid when their TSH was greater than 5.1 and their T4 was low. If they had also checked thyroid antibodies, they likely would have found a much larger number of people with thyroid disease than they did. The helpful part about this study was that it was all about refinement, and it helped cut through the noise of symptom behavior in those with thyroid disease. They correlated how the symptoms related to thyroid blood levels of those participating in this study. That’s a big distinction that we need to make. Dynamic symptoms are valuable because they give us a better idea of how we felt before and how our health is progressing down the line. Especially when think about someone developing thyroid disease from scratch, or losing control of the management of their thyroid disease, asking these kinds of symptom-based questions can be truly enlightening. In Conclusion: We want to keep in mind “evolving dynamic symptoms” which have changed over time. If we can identify a point where our symptoms developed or got worse, it might point us in the right direction to understanding if we have thyroid disease. 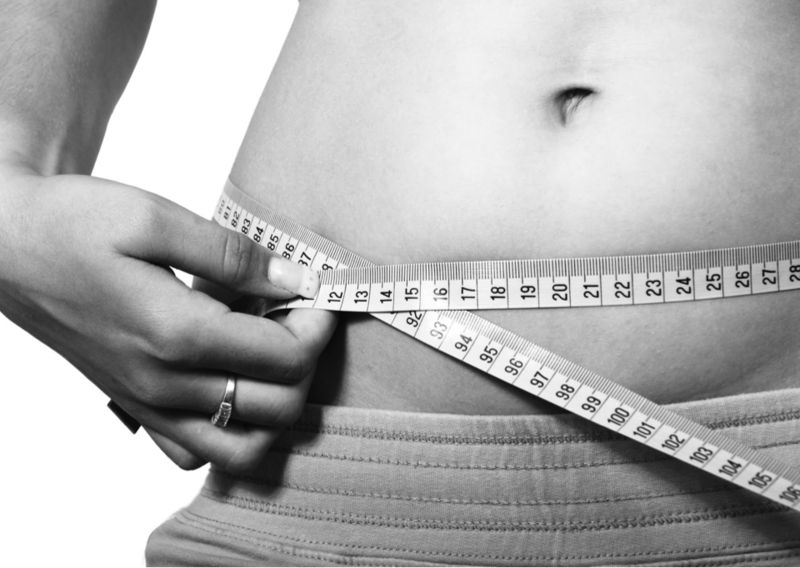 Sensitivity – how many people with an underactive thyroid did NOT have a particular symptom. 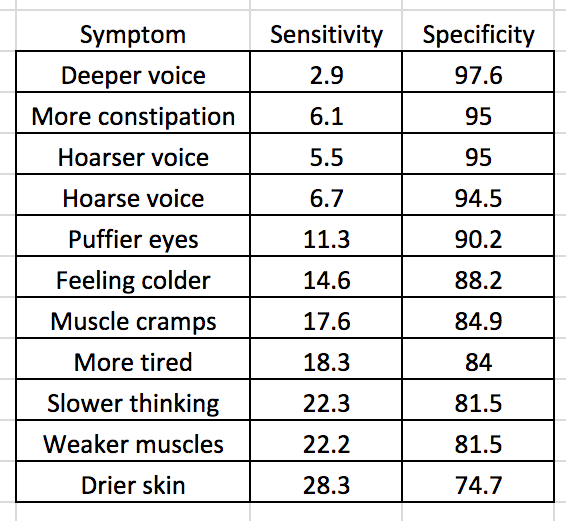 What you will initially notice that none of these symptoms have a high sensitivity number. This means that your thyroid could be off, yet you may not have one of the classic symptoms. The shortcoming about the classic symptoms, and the long list of possible symptoms, is that many assume that if they lack some of the symptoms that the problem must not be from your thyroid. Key Insight: If there were a symptom that had a sensitivity level in the high nineties, then anyone who lacked that symptom would not likely have a problem with her thyroid. None of these results were even as high as 30%. You will also notice that each of the listed symptoms has a very high specificity number. That means that 81.5% of people who are noticing weaker muscles did have an underactive thyroid. This study also showed how many symptoms people tended to have in total. 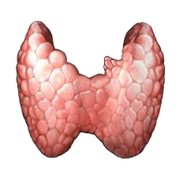 It was totally fascinating, because most had between 1 to 3 of the symptoms, and the number of symptoms that they had did not relate to how badly they were hypothyroid. In Conclusion: It is not about counting symptoms when it comes to being hypothyroid – it is about the combination of symptoms that you have. A unique, but smaller, combination of dangerous symptoms can be just as dangerous. What we also know from this data is that people that have more severe blood levels do not necessarily have the worst symptoms or a larger number of symptoms. This is an important point, because in many cases doctors do not pay enough attention to people whose blood tests are close to normal or just off by a little bit. What do you do if you have one of these symptoms? If we have one of the important 11 symptoms listed above, we need to start taking care of it right away. If you have not yet been diagnosed as having a thyroid disease, the first thing you will want to do is get a thorough check-up – ideally by a Naturopathic Physician who specializes in thyroid disease. 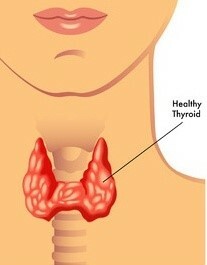 I cannot stress how important these are for the health of your thyroid. 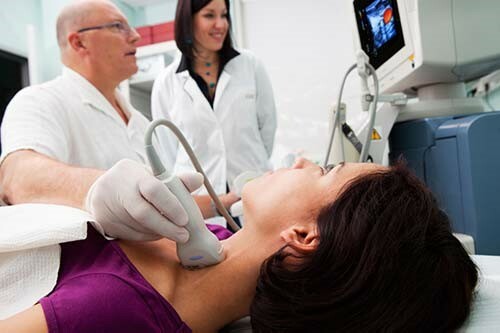 It does not expose you to radiation and it can provide so much information to you about the status of your thyroid. 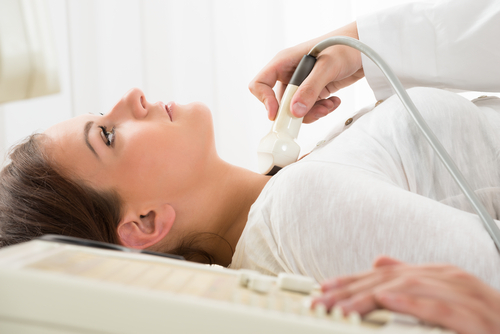 It is so valuable to get an ultrasound, so make sure you book one today if you are exhibiting these previously mentioned symptoms. Just as importantly, have a good understanding of the difference between “normal” ranges and “optimal” ranges. Normal can sometimes occupy this space where it is simply common and this is especially important when it comes to your thyroglobulin, thyroid antibodies and TSH results. Even if it is common, it can still definitely be a problem! Trying to figure out the big root causes of thyroid disease, specifically for you, is absolutely crucial to your health. Digging deep into your root causes and discovering the cause and finding out the proper treatment for your thyroid gland is going to really benefit you in the long-term. How is your digestive system working? Are you carrying toxins in your body? Do you need to know more about your genes? Is your adrenal rhythm healthy or is it off? In Conclusion: These are all important questions to answer on your journey back to good health. Consider the type of medications that you are currently using. I have found that the greatest number of people do well on clean versions of natural desiccated thyroid (NDT). WP Thyroid is my personal favorite. It is important that you are not consuming an excess of 300 micrograms of iodine each day. Please know that thyroid medications contain iodine, as well. We need to make sure that we are keeping good track, because too much is often just as dangerous as not enough iodine (2). Make sure to avoid synthetic folic acid – nearly everyone with thyroid disease has MTHF Gene abnormalities. Have you been worried about the status of your thyroid? Take the first step in learning more about your body, and take the Thyroid Quiz today. It is going to give you the helpful information you need about your thyroid and will be your first step to getting your health back on track. Take it today, and learn more to benefit your body right away.